ASM (an online magazine) is covering the Toy Fair 2008 in NY, and visiting the stands from several toy manufacturers. 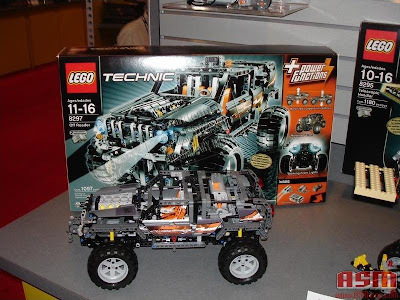 Today they bring us new photos from upcoming the LEGO TECHNIC models for 2nd half 2008, which you can see below (click on the pictures to enlarge and see more details). Check former related posts and respective comments for further discussions about these sets features , ,  and . Posts for the 8293 (Power Funtions Motor Set), may have also some related info of your interest. - It contains 712 parts, and two Linear Actuators. - The new Linear Actuators seem now that will have colors similar to the PF remaining elements (mainly light/dark gray, and probably some orange). - The arrows on the box seem to indicate that arm has 3 moving joints. Also I think the black loader moves synchronized with the last arm element (under action of upper Linear Actuator), some how like in 8419. - There is just one knob/wheel at the back, apparently to move the arm. This if the turntable rotates manually!? - The new shorter (3L) universal joints can also be seen on top of the excavator arm. A more compact element to deliver torque into the Linear Actuators using rigid axles (like I mentioned here). We can speculate a lot more from the picture, but hardly we can be sure about. More detailed or some close-ups would be welcome. - It contains 1180 parts (even more than the Off Roader) and one Linear Actuator. - Also one knob/wheel at the back, which seems to be used to raise/lower the boom, or to extend it. - Somehow disappointing is the use again of a basic mechanism to tilt the forks, like in 8283. Quite unrealistic! - It seems to feature a 4WS design. 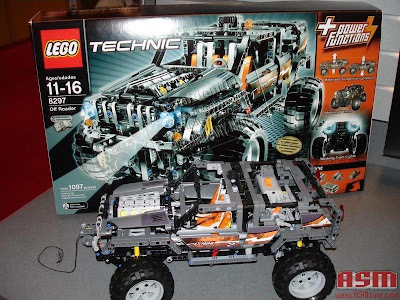 - It seems to include the same wheels as in 2006 TECHNIC Dune Buggy/Tractor (8284) front axis, while the Off-Roader seems to have got the rear axis ones. And finally, the 8297 - Off Roader again, with nothing special to add relative to the last posts about this set, apart it's now known to include 1097 parts. Generally and from these new boxes pictures, it seems the posters are not included anymore. Also it seems that each set comes with 2 instructions books, so most likely one for a main and another for an alternate model. However as written into a TLG Press Release from Saturday (16.Feb), about the company new products on the '2008 American International Toy Fair', "...The Cherry Picker and Off-Roader include the LEGO Power Function System, bringing the models to life, while the other kits show how to add the Power Function Accessory Set to non-powered models". This may relate or give an hint, to the contents of the 2nd instructions book for the Excavator and Telescopic Handler!? Thanks Merman, for bringing these photos to my attention, so fast! But the prices were advanced in the comments of this post last December. However they were not certain, as you can check from the PF Motor Set (8293) advanced price, at the time. good.......I am a toys manufacturer supplier and looking for partners globally. If any one interest please contact me through this website.